The Importance of Earnest Service » Blog Archive » Blog Service of Firing Employees: Is There a Good Way? This entry was posted on Monday, April 15th, 2019 at 10:50 am	and is filed under Fire, Firing, Jobs, Kindness	. You can follow any responses to this entry through the RSS 2.0 feed. You can leave a response, or trackback from your own site. I don’t believe there is any easy way to let someone go. I have held many positions before I started my own company, and several of them I was fired just because it had to be done for the company’s sake of downsizing… Other times I know it was definitely my fault. Lack of enthusiasm for the job. Sometimes it’s political! Yes, counting the current administration. You can be doing a really excellent job for the company, but not get along with your boss, or you see that he or she is taking credit that you deserve… In any event you get the point, many reasons to let someone go. I believe Jobs was even fired from his very own company for a while… Until they floundered. A floundering Apple needs a Jobs. Some of the most talented editors I’ve known were fired. You point to politics and that’s one reason. Jealousy/competition is another. In a different industry one of the best colonels my husband worked for had a meteoric climb to Lt. Colonel–the youngest at the time to reach that title– when he came across a jealous boss and he was almost kicked out as a result. I have countless examples and even some in which like Apple, the former employer realized the mistake they had made but unlike Apple, didn’t have the guts to rehire the person. 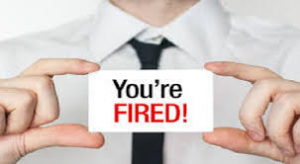 Firing anyone is not easy, but given the procedures (documenting poor performance in writing and meetings with the potential pink-slipped person to discuss these issues) many HR departments require before someone can be fired should give the employee a clue that all is not well. I’m a little puzzled by one HR person in the article who said she tries to help the fired person find another job…I would take that with a grain of salt unless she directs them to find a job in another field, depending on why that particular person was let go in the first place. I get your point but I’ve known PR people who are excellent at handling one project at a time so that an agency isn’t for them but they might do well at a slower paced company or non profit. Then there’s the famously horrible boss who gets along with few. HR knows about the situation but the person is protected–a relative of the owner perhaps? You’re right in that the quote needs fleshing out but may have been cut to fit the allotted space in the article. Much depends upon the abilities of who does the firing. 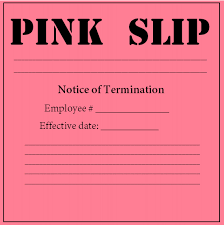 It also depends upon the reasons for termination. There are about as many firing stories as there are people, which amounts to no quick answers. 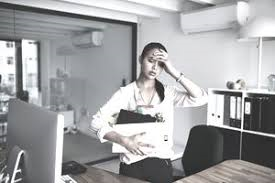 Common decency would require an employer to assist in finding other employment, assuming bad behavior, incompetence and laziness are not involved. Unfortunately such entities are in short supply, thus the crowding of unemployment offices. This is not a job I would apply for, but there are those who enjoy giving the axe. One such person was in turn fired for having way too much fun at this practice. I sometimes wonder where he landed after that — out of state, perhaps? Like you, I would not want the job to fire people and the man or woman who relished the task would be considered unusual by most. Wonder if after losing the job this person mellowed? Here’s hoping. Lots of companies get the fired off their consciences by sending them to outplacement services that they pay for. I’ve known people who have taken advantage of these opportunities but can’t put my finger on whether any have captured their next job as a result. The services offer experts at resume writing; coaches who counsel about how best to interview; write cover notes; fill out online job applications and how to dress, if that’s an issue, and so forth. There is no pleasant way to fire anyone unless perhaps you know they are miserable and don’t have the courage to give a resignation. Firing people on Friday before or after lunch, the current President’s specialty, is dreadful and in humane. Taking responsibility for exercising poor judgment in hiring the individual doesn’t really help either party. Downsizing sounds more attractive although the reality is the same financially. Outsourcing assistance, extended insurance benefits and availability of a vague letter that testifies, if it is the case, to the person’s character help. The safety or security concerns that now permeate our lives make any kind of firing very difficult. There is a spoken or unspoken fear of reprimanding or even dismissing, or out right firing someone who may or may not have a violent or even demented reaction. This poses multiple problems for all of us in our daily lives and more so in Human Resource decisions. The prevailing social atmosphere in our country constantly augments rage which manifests itself in heretofore unimaginable ways. Publisher Si Newhouse wouldn’t fire high profile editors directly. Legend had it that they could be on vacation when they’d get a call from the press asking about the situation and that often was the first they’d heard. I knew of one downsizing when the division of a large corporation was going out of business where those with fancy salaries and contracts had to fight in court to get a cent of severance but the severance of a friend who had no contract and whose salary, while generous, was modest by comparison, was voluntarily extended until he got another job.